TUCSON, AZ (Tucson News Now) - Former University of Arizona men's basketball coach Lute Olson will be honored for his significant contribution to the U of A and the Tucson community with a statue, according to a statement from Director of Athletics Dave Heeke on Tuesday, Aug. 29. The statue will be located north of the Jim Click Hall of Champions on the Eddie Lynch Athletics Pavilion Plaza. According to Heeke the statue project is estimated to cost $300,000 and construction should be complete by March 2018. "We're thrilled to recognize Coach Olson, not just for what he accomplished on the basketball court, but for what he means to Arizona and our community," Heeke said, in a recent news release. "Through the success of Arizona basketball, Lute helped introduce people around the country to our University and this city, and he forever changed the trajectory and perception of our athletics department. 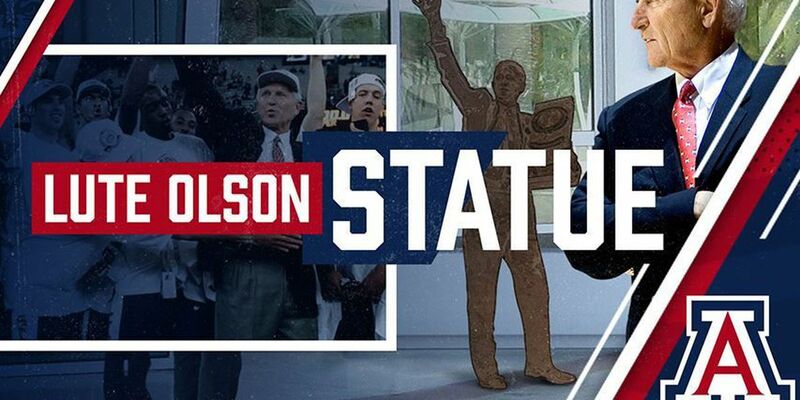 His legendary status is worthy of this honor, and we're proud that his statue will be visible to the thousands of people that visit McKale on a yearly basis." Olson served as the head coach at Arizona for 24 seasons and amassed a 589-187 (.759) record. He led the Wildcats to the 1997 National Championship, four Final Four appearances, 23 consecutive NCAA Tournaments and 11 Pac-10 titles, while earning Pac-10 Coach of the Year honors seven times. Olson also guided Arizona to 20 consecutive 20-win seasons, and, at the time of his retirement, was one of only three coaches in NCAA history to record 29 or more 20-win seasons. For all of his accomplishments, Olson was enshrined in the Naismith Memorial Basketball Hall of Fame in 2002. "This is a wonderful honor and I'm grateful to the people at Arizona who made the decision to put up a statue," Olson stated. "I was fortunate to have a successful career that spanned a number of different locations, but Tucson and the University of Arizona have become my home. I'm deeply touched at this recognition and I want to thank all of the staff members, student-athletes and fans, who made, and continue to make, my life at Arizona something special." The location of the statue was determined based on a number of factors. The Eddie Lynch Pavilion Plaza is connected with central campus and the UA mall, which sees the greatest amount of the area's general traffic. That area also sees a large percentage of the basketball gameday traffic. The Plaza also has sufficient room for the potential implementation of additional statues. The south side of McKale was not considered because of potential arena expansion plans in the future. The construction of the statue coincides with the 30th anniversary of the 1988 men's basketball team. The '88 team was the first in program history to qualify for the Final Four. They also won Pac-10 regular season and tournament championships en route to a 35-3 record. Because of this team's accomplishments, it's fitting that the statue of Olson will become a reality this year as a way to honor the great '88 team. To assist with some of the project cost, Steve Kerr, current Golden St. Warriors head coach and prominent member of the 1988 team, is partnering with Original Retro Brand to sell Arizona Kerr replica jerseys and tees. Kerr has agreed to donate his royalties from the replica-jersey sales to the Lute Olson Statue Fund. In addition, ORB Founder and CEO Marc Herman has agreed to match Kerr's donation. The Kerr tees will be available exclusively at the McKale Center A-Store from Thursday, Aug. 31 through Sept. 9 and on football game days at various merchandise tent locations. In addition, the online sale of tees will begin on Aug. 31 at www.BearDownShop.com , www.Originalretrobrand.com, and www.UABookstore.com. The replica jerseys will be available on Wednesday, Sept. 20 in store and online. The collection will also be available at select Just Sports locations in Tucson and Phoenix after Oct. 15. Because the donations from Kerr and Herman are expected to cover only a small portion of the cost, the bulk of the statue project will be supported through private donations, which can be made by clicking HERE. As part of a continuing effort to recognize Coach Olson and his accomplishments, he and his wife Kelly will be honored at halftime of the home football game against Utah on Sept. 22. Coincidentally, that is also Olson's 83rd birthday. As for the unveiling ceremony, which is tentatively scheduled for March, all former men's basketball letter winners will be invited back to take part in the occasion. More details will be shared as plans are finalized.